Another day of trials is in the books for athletes trying to punch their ticket to Rio. After a short break in the competition schedule, twelve more have advanced to the next round with the hopes of grabbing a spot among the top three in their respective events, and hitting an Olympic qualifying standard to secure their place on the 2016 US team. 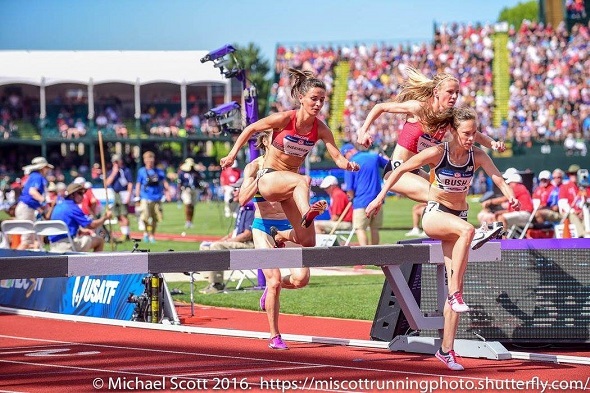 Ashley Higginson (Princeton ’10) ran an aggressive first lap of the 3000m steeplechase, taking the lead to split 72.9 seconds through the first 400m. Higginson had company as she approached 800m where the leaders ran a comfortable 2:29.0 at the second lap. At 2k Higginson trailed the lead pack and sat in sixth place. She was able to hold onto ninth with a finishing time of 9:38.55. American record holder Emma Coburn got the win setting a new US Trials record of 9:17.48. In an emotional women’s triple jump final Imani Oliver (Princeton ’14) fell short of her Olympic dream. Her first jump of 13.78m (45-2 1/2) with a 1.5 wind aid put her in third early in the competition, while several athletes failed to record marks. On her second jump Oliver fouled but maintained her third place position. The shortest distance of the final for Oliver was 13.66m (44-9 3/4) for her third jump. Athletes who stood in the top eight were given three more jumps to conclude the competition. After another foul on her fourth jump Oliver was still a contender for the bronze medal. Her 13.71 (44-11 3/4) proved to be a step in the right direction but Christina Epps responded with a 14.17 (46-6) for second moving Oliver to fourth behind Andrea Geubelle. Oliver’s final jump of the night was her best, 13.83 (45-4 1/2), and good for fourth. Autumne Franklin (Harvard ’16) and Jade Miller (Harvard ’17) made their appearance in the first round of the women’s 400m hurdles. The steady rain and slippery track made clearing all ten hurdles even more of a challenge for these athletes. Franklin had a lot of ground to cover out of lane three in her heat of the 400m hurdles. At the 150m mark Franklin made a move that would put her in third in 56.17 and advance her to the semi-final round Friday at 7:31 p.m. Miller struggled to find her rhythm and ran 57.77 to finish fifth in her heat. All of the favorites expected to advance in the women’s 5000m, including Abbey D’Agostino (Dartmouth ’14) have made it to the final round and will run Sunday at 7:28 p.m. D’Agostino was in the second heat, which was the fastest of the two qualifying heats in this competition. Early into the race D’Agostino settled into the back of the pack with eyes on Molly Huddle who took the lead three laps into the race. At 3k D’Agostino was in the mix running 9:27.27, which held her in sixth, but at this distance the race for second was up for grabs. The next 1000m D’Agostino moved up to fourth behind Marielle Hall running her second fastest 400m split, 72.82, in the race. In the last ten meters she moved to sixth running 15:29.66 to qualify for the final. Johnny Gregorek (Columbia ’14) was able to move onto the next round of the men’s 1500m final. His 3:43.04 was an automatic qualifier as 24 advance to the semis, six in each heat and the next two fastest times. Gregorek said he was confident he would make it out of the first round and though the rain put a damper on the evening for some it did not affect his performance. Kyle Merber (Columbia ’12) is also through to the next round after running 3:50.07 for third in his heat. Merber left the track feeling happy with his race after coming back from a sacral stress fracture, which kept him out for the season. Thomas Awad (Penn ’16) ran 3:42.49 nearly beating Matthew Centrowitz at the line who ran 3:42.48. Awad was fifth in his heat so he automatically qualifies for the semi-finals Friday at 7:12 p.m.
strong>Sam Mattis (Penn ’16) had a rough start in the men’s discus competition with a foul and just two more chances to advance to the final. His second throw was his best of the qualifying round, 60.93m (199-11) pushing him into second and earning him a place in the final. Princeton throws coach Jeff Milliron was unable to come close to his season PR of 61.52m (201.83), which would have easily qualified him for the finals. His best throw was 56.7m (186-1). Bryan Powlen (Brown ’10) failed to record a mark collecting three fouls in the competition. The men’s discus final is scheduled for Friday at 6:30 p.m.
Kelsey Hay (Penn ’16) threw 42.25m (138-7) for her second throw in the women’s javelin. She will not advance to the final round. This entry was posted on Friday, July 8th, 2016 at 7:13 am. It is filed under Olympics, Spotlight. You can follow any responses to this entry through the RSS 2.0 feed.